Villa Rentals and Concierge Service on the beautiful island of St. John in the US Virgin Islands. Welcome to your home away from home. Contemporary Tropical Resort Villa located right on the ocean’s reef front right in Chocolate Hole Bay. A beautiful, stone 2-bedroom 2-bath luxury pool villa surrounded by lush gardens and bismarckia palms. 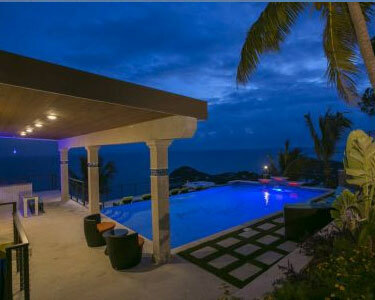 Luxury 6-bed villa located 70 stories above Rendezvous Bay with 180 degree views. I found Julie by asking Palm Tree Charters, St. John who they recommend using to book our short notice trip to STJ. After a quick and simple conversation on FB it all started. She was a great communicator and was convenient to work with. With our 2 week notice she found a perfect home in Fish Bay. I was impressed that Julie took the time to come and meet us for a drink when we offered. Love the idea that I was able to meet and worked with someone local on the island. Working with someone who lives on the island and to support the local community as much as possible is a huge plus! I'd definitely recommend Julie to anyone who's looking to book a villa/home on St. John U.S.V.I. Look forward to coming back again in the future.